Have you ever noticed unsightly little red bumps on your skin? If so, they may be a condition called keratosis pilaris. Conventional treatments for the issue can be rather harsh on the skin, but there are natural options. This keratosis pilaris exfoliating cream helps moisturize and exfoliate for clearer skin. Also nicknamed “chicken skin,” keratosis pilaris is an unsightly skin condition that manifests as red patches and bumps. It resembles goosebumps and appears most often on the back of the arms and thighs. They feel rough like sandpaper and are very small, about the size of a salt grain. Sometimes they occur on the face and can be mistaken for acne. There may also be redness around the bumps that varies from light pink to bright red. No one is exactly sure what triggers these little red bumps, but certain groups of people and those with dry skin are more prone to them. Pregnant women, overweight people, and those with eczema or dry skin are more likely to have keratosis pilaris. Skin naturally contains the protein keratin, and about 50% of us are genetically predisposed to overproducing this protein. When excess keratin becomes trapped inside the hair follicle, it forms a rough, raised plug. These clogged hair follicles then cause inflammation, turning the surrounding skin red. Since the hair follicles are plugged with excessive keratin, gently exfoliating the area will help clear them out. (Don’t use anything too rough however, as that can just further irritate the skin.) It’s also important to moisturize the skin, as the problem is caused by overly dry skin in the first place. Using anti-inflammatory products will soothe the skin and tame the accompanying redness. Conventional treatments typically involve steroids, but here we’re using the potent anti-inflammatory benefits of turmeric and lavender essential oil. This recipe for keratosis pilaris cream uses baking soda and several other natural ingredients to exfoliate the skin. All ingredients have a finer particle size that’s gentler and very cleansing for dry skin. Baking soda has a very high pH of 9 though, which makes it very alkalizing. Long-term this can cause a problem, as skin is naturally acidic with a pH that ranges between 4 to 5.5. Some Himalayan sea salt provides extra exfoliating power and nourishes the skin with dozens of minerals. 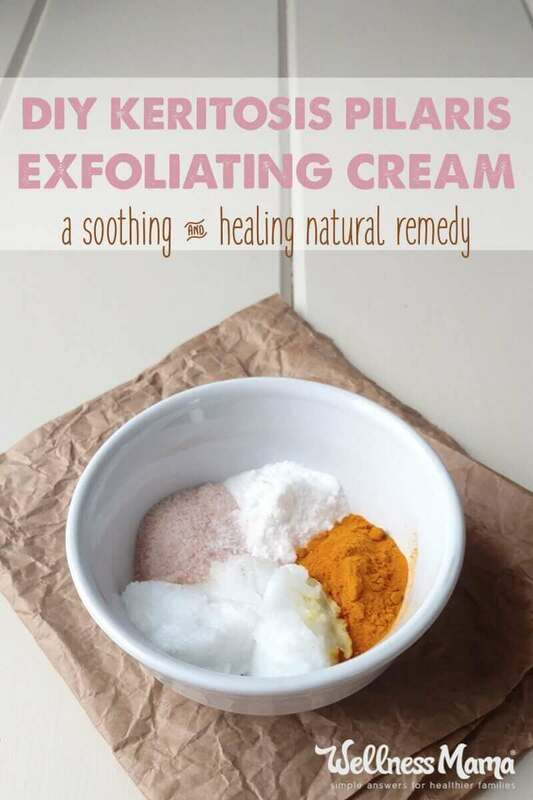 Turmeric powder also provides some exfoliation but primarily decreases inflammation. Lavender essential oil further soothes irritated skin and decreases inflammation. Unrefined coconut oil rounds out the recipe to hold it all together and get that creamy consistency. Coconut oil is high in lauric acid, an intense fatty acid that helps break up excess keratin. It’s important to use this cream consistently to improve the appearance of keratosis pilaris, a few times a week or even daily for those prone to frequent outbreaks. Well exfoliated skin will be less likely to accumulate the dead skin cells and keratin that plug hair follicles. In a small bowl combine all of the ingredients and stir thoroughly. As you stir, the coconut oil will become creamier in consistency. Stir until well combined, then store it in a glass jar. To use, thoroughly rub the cream over the affected area, then rinse with warm water. Coconut oil may be too heavy a moisturizer for some facial skin types. Some people seem to do really well with it, while others get bad breakouts when using it on the face. You can follow the cream up with a gentle soap if you find that it doesn’t agree with you. Alternatively, you can omit the coconut oil entirely and use 2 tablespoons of another oil like olive oil. Those with very light colored skin may find that the turmeric gives their skin a yellow tinge. If that happens, wash the keratosis pilaris cream off with soap, which should take care of it. Are you affected by keratosis pilaris? Have you ever found a remedy, and what did you use? I’d love to hear!